Documenting and recording historic sites is an essential element of historic preservation work. Among other benefits, methodical documentation projects increase awareness of historic building practices and provide information for ongoing interpretation and maintenance. HPEF-sponsored events and publications have long included attention to documentation training. Beginning in 2013, HPEF has developed and co-organized projects to assist further documentation training and support Historic American Buildings Survey efforts to increase examples of twentieth century contained within the HABS/Library of Congress collection. More information. In October 2014, the AIA Historic Resources Committee, the American Institute for Conservation of Historic and Artistic Words and the Frank Lloyd Wright Foundation organized a colloquium titled From Grime to Sublime: Cleaning Masonry Buildings. HPEF provided support through its Partners in Training program to record and post the event online. Videos of the nine sessions on the philosophical, aesthetic, technical, scientific, and economic factors that should be considered when cleaning the exterior surfaces of stone, brick, terra cotta, and concrete are being added to the HPEF website. More Information. Over its thirty year history, the Historic Preservation Education Foundation has supported the development of numerous tours for conferences, workshops, and publications. Select tours are now available as PDF downloads. HPEF is also converting tour material to digital walking tours with new images and content accessible by smartphone or tablet. The first project explores the SoHo-Cast Iron Historic District in New York City and is based on a tour originally developed by Margot Gayle and Robin Lynn. More information. HPEF offers the opportunity for Continuing Education Credits through the American Institute of Architects (AIA). Learning units meeting the requirements of the AIA Continuing Education System are available online through a series of quizzes based on the National Park Service Preservation Briefs. The quizzes are a collaborative project of the Historic Preservation Education Foundation and the AIA Historic Resources Committee. More information. 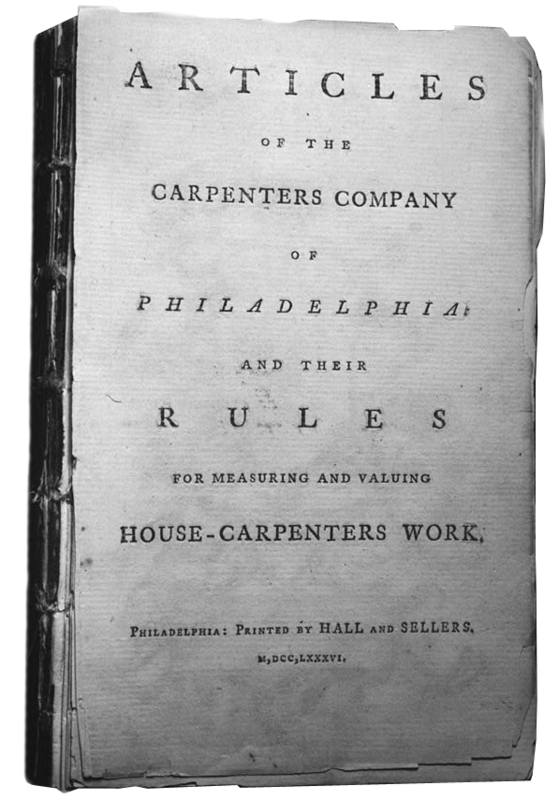 During the eighteenth and nineteenth centuries, local carpenters' associations in the United States published rule and pricing books to ensure that they received consistent pay and were able to charge accurately for their work. These books provide valuable insights into the development of American architecture and building practices. Continuing the work of preservationist Lee H. Nelson, HPEF is committed to increasing awareness of carpenter rule book history through the publication of rule book materials and bibliographic resources. More information. Throughout his long career as a National Park Service architect, Lee Nelson helped nurture and shape the historic preservation movement in the United States. He was a co-founder of the Association for Preservation Technology International and led the restoration of Independence Hall and other historic sites. Working with a University of Oregon student intern and staff at the University's Special Collections & University Archives, HPEF has developed a detailed annotated bibliography of Lee Nelson’s papers to aid those interested in utilizing the collection in the future. More information. HPEF is a sponsor of the Building Technology Heritage Library (BTHL), a web-based digitized collection of archival architectural and construction trade catalogs, house plan books, and related publications. The library was established in 2006 by the Association for Preservation Technology International (APT) to provide design professionals, building owners, historians, preservationists, and others with an in-depth look at early building construction material culture. At present, the collection contains over 3,100 items from the nineteenth century through 1964. In 2014, HPEF renewed its commitment to the Building Technology Heritage Library by awarding APT a grant through the HPEF Partners in Training initiative. The funding will enable the BTHL to add approximately 1,200 items from the Southeastern Architectural Archive's trade catalog collection at Tulane University. Visit the library.